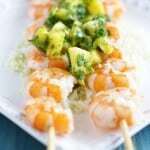 Home » Dairy Free » Grilled Shrimp with Pineapple Chimichurri. Grilled Shrimp with Pineapple Chimichurri. 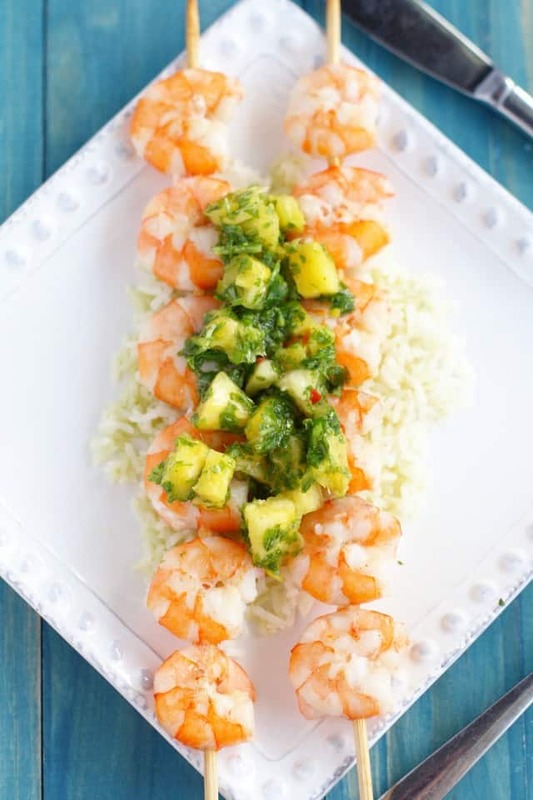 A fresh taste for summer – this grilled shrimp with pineapple chimichurri is sure to hit the spot! Gluten free and grain free, too! Now, I ‘m not a big seafood person. I love salmon, and occasionally I will eat some shrimp, but that’s about it. I’m the opposite of Darryl, who is a huge seafood person. He would definitely cook a lot more of it if I’d let him, but since I feel like cooking seafood in the house makes it smell like a dock in here, he sticks to ordering crab and scallops and lobster at restaurants. I can deal with shrimp, though, and I love to make shrimp skewers and grill them. They cook so quickly and with a simple sauce they make a really delicious and summery meal. 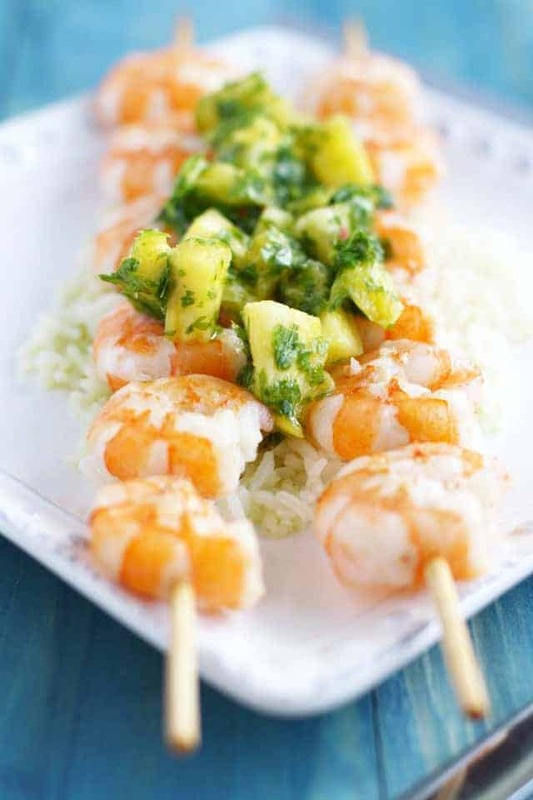 Simple grilled shrimp skewers with a sweet and savory pineapple chimichurri sauce. Make the chimichurri: Place the cilantro leaves, canola oil, salt, pepper, and lime juice in the food processor. Pulse until finely chopped. Put into a bowl and add pineapple and red pepper flakes. Set aside. Heat your grill to medium high. Place the shrimp on skewers, and brush with olive oil and season with salt and pepper. Grill for 2-3 minutes on each side or until pink and opaque. Place on a serving tray and brush withe melted vegan buttery spread and season with salt and pepper. 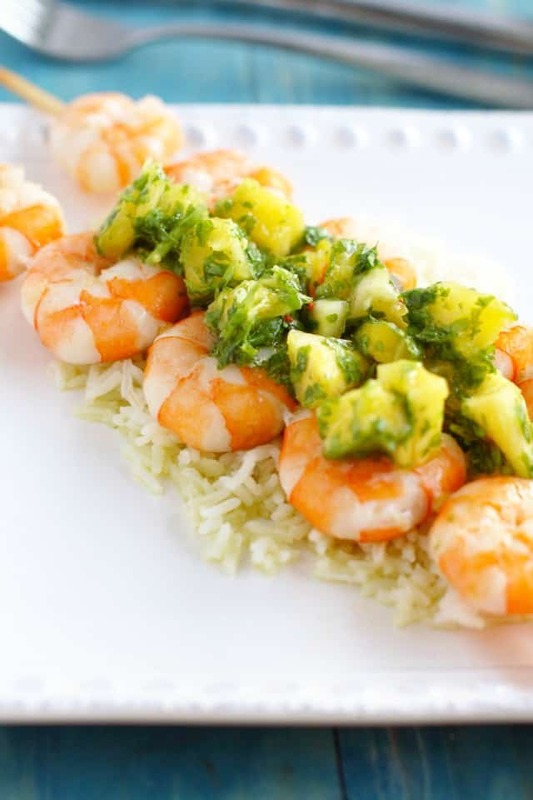 Serve shrimp over rice with chimichurri sauce. Chimichurri adapted from this recipe. What easy summer meals have you been making lately? I love this! I’ve done chimichurri on steak, but never thought to do it on seafood. And with pineapple?! Yum! Summer is definitely my favorite food season – soooo many tasty fruits and veggies! These skrimps are so clever! Love the idea of a pineapple chimichurri for allll the flavor! This looks so refreshing and delicious. A perfect summertime eat. Oh this grilled shrimp looks fantastic, Kelly! I love the pineapple chimichurri! Looks so flavorful! That pineapple chimichurri sounds just heavenly!